About 1,000 photos by NASA’s Viking 1 orbiter were processed to make this image, which provides global color coverage of Mars at a scale of 0.6 miles (1 kilometer) per pixel. NASA is considering launching another orbiter to Mars in the next decade. The space agency is asking American companies to suggest design ideas for the possible robotic Mars orbiter. Launching in the 2020s, it would capture high-resolution imagery and provide increased data-relay capabilities from surface vehicles back to mission control on Earth. "Currently, we depend on our orbiting science missions to perform dual service in making measurements and acting as communication relays, but we can't depend on them to last forever," Grunsfeld added. "This new orbiter will use cutting-edge technology to revitalize our ability to continue to explore Mars and support transformative science, including a potential sample-return mission in the future." NASA currently has three operational spacecraft in orbit around Mars: Mars Odyssey, which launched in 2001; the Mars Reconnaissance Orbiter (MRO), which lifted off in 2005; and MAVEN (short for Mars Atmosphere and Volatile Evolution), which headed toward the Red Planet in 2013. The space agency plans to award $400,000 design-study subcontracts for the new orbiter in June; these studies would be completed four months later, NASA officials said. The new orbiter would add to an already bustling fleet of robotic Mars spacecraft. Odyssey, MRO and MAVEN are joined in orbit by Europe's Mars Express spacecraft and India's Mangalyaan probe, and NASA's Opportunity and Curiosity rover are trundling across the Red Planet's surface. The first phase of the European-Russian ExoMars mission launched last month, blasting the Trace Gas Orbiter and a landing demonstrator toward the planet; phase two will launch a life-hunting Mars rover in 2018, if current schedules hold. And NASA will launch the InSight lander to probe Mars' interior structure in 2018, and a life-hunting, sample-caching rover in 2020. The space agency said it aims to bring the 2020 Mars rover's samples back to Earth for analysis at some point, though there is no mission on the books that will do this. And that's just the robotic side of things. 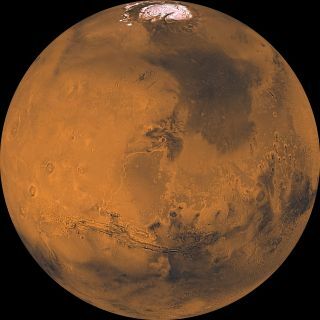 NASA also aims to get astronauts to the vicinity of Mars by the end of the 2030s. This ambitious effort will require considerable international cooperation, agency officials have said.